Laini Taylor's blog: ONE DAY!!!! DAYS OF BLOOD & STARLIGHT!! Look what just arrived on my porch!!!! My Back to the Future boxes! Ha! Every time I get a box of my books from my publisher I explain on here about Back to the Future boxes, and I will again. It's that in the movie Back to the Future, at some point, McFly's dad (Crispin Glover) gets a box of his brand new book from his publisher and it is a moment in film that is only remembered by those of us who wanted to be writers! It's a phenomenon. Do you remember it? And this is the first time my Back to the Future boxes have actually been printed with my book! A new level of geek-chills! I can't tell you the spastic thrill of knowing these boxes are out in the world, being unpacked, looking so gorgeous. YAY! One more day! Less than one day! Yippeeeeeeee! Did you catch yesterday's post on the AMAZING BOOK TRAILER CONTEST? Please spread the word to your friends and talented kinfolk! Section 1 of the "hamsa quilt"! Isn't it cool? I have a bunch more photos to add. Now that you see it, if you want to contribute a hand to the "quilt", please do. Your name will be included on your square. Not sure what I'm going to do with this, but I may make a large print for my wall. It would look pretty freaking awesome as an actual quilt, but that is probably not going to happen any time soon! (Maybe someday though!) If you want to add a square, email or tweet me your photo. Thank you! And lastly, the actual tour. If you're in one of these areas, please come and say hi! It's meant to be given that today is the day that Doc invented time travel (Nov 5, 1955)!! So excited! I am trying to contrive a way to leave work early tomorrow so I can go pick up not only mine but my sisters & friends at Changing Hands! See you on Friday! I TOTALLY REMEMBER THAT MOMENT IN THE MOVIE!! Haha ^^'' I always thought it must feel awesome to have physical proof that something you've written is now out there, where other people can pick it up and it will hopefully enrich their lives in some way. 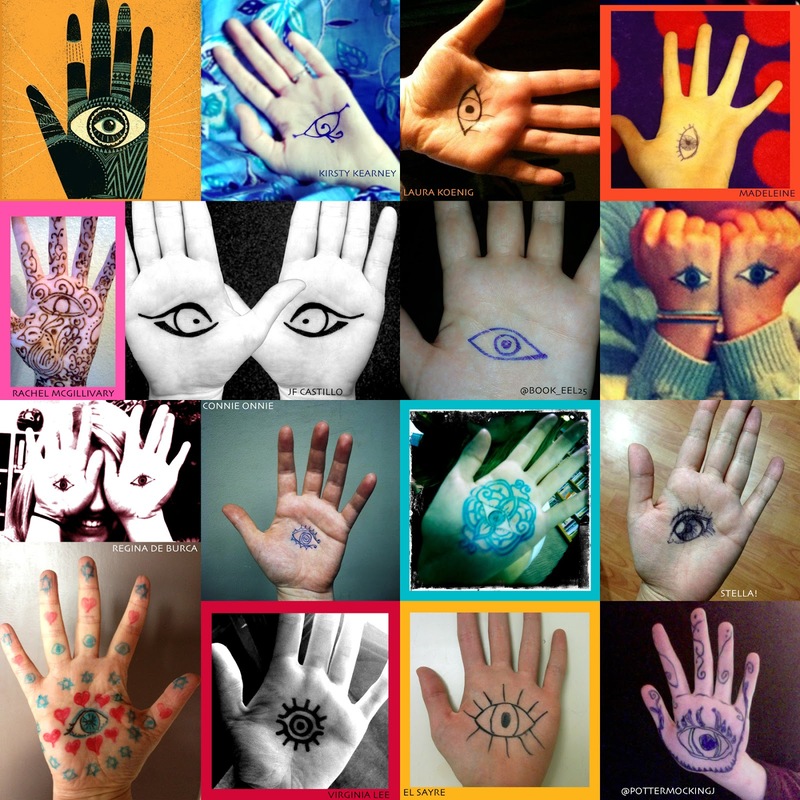 Those hamsa marks are so cool! I love how they all look different from one another! All of these things make me SO EXCITED!!!! 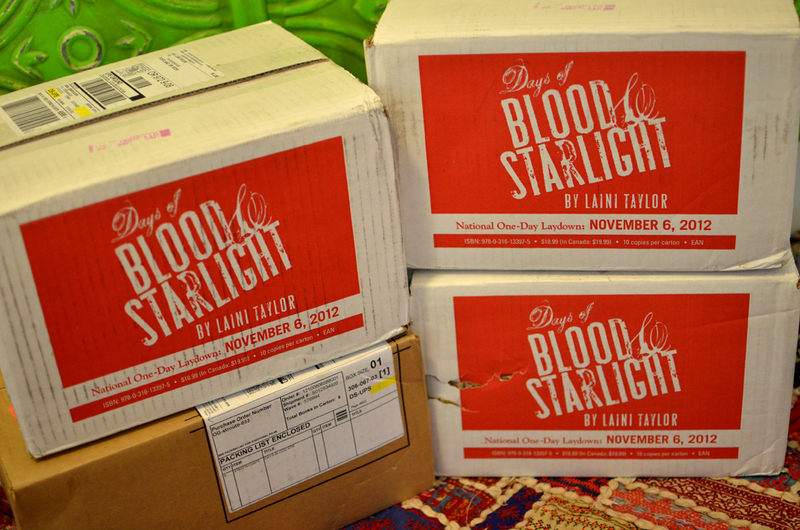 Those are some seriously pretty boxes! Yay! And yes. I do remember that moment. The best. 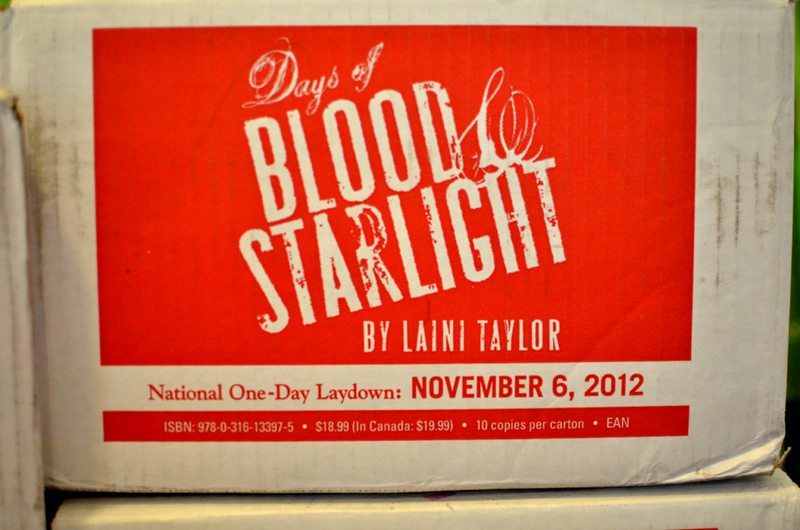 Laini, I am seriously way more excited about your book coming out tomorrow than the election. (My priorities *might* be skewed. *Might*) I just re-read Daughter of Smoke and Bone to make sure I was up to speed...and it was just as amazing and as heartbreaking as the first time! My copy shipped today and should arrive by the eighth. Yay! Mine will be delivered to my office and I have a Long Lunch in my Calendar. Coincidence?!? Doesn't come out until the 9th here but I am definitely going to the closest bookstore and making grabby hands for it IMMEDIATELY once it does. Wheeee! Going to order my copy of "Days" tomorrow - and may even get around to doing a hamsa for you, if I have time! Aaaaaargh, no Kindle version yet? Victor, there is a kindle version! Hope you're coming to Illinois at some point! I have a hamsa picture, but the email is not working. Perhaps I'm using the wrong email address? What is the correct address? Where! Where is it! The Kindle version, I mean. I'm sure it must exist somewhere, but according to Amazon, only the hardback, paperback and audio CD are available right now. And I totally don't want to order a printed copy, seeing as it would mean some more waiting. Victor, are you not in the US? I see it as avail on Amazon on my screen, and have heard pre-orders downloaded late last night. Happy Book Birthday!!! So, so excited and can't wait to read. But glued to the tv with election coverage. I'm going to be devouring it during the commercial breaks. :-) Excited that you're coming to Glendale so I can get it signed. I work at my local library and we love to get authors in for signings. I know that it's too late now, but how can we make a request in the future? We're in Burbank, not too far from Glendale, and we would LOVE to have you!!! There is already a date for release in Mexico? Ah, so that's the problem. Nope, I'm not in the US, I'm in Romania. And I'm developing a strong dislike for Amazon right now. maybe I'm a writer somewhere deep down. I was thinking of the back to the future moment before you even mentioned it. and a longing betrayed itself in the middle of me somewhere. And I want to open the box and smell the books and rub them all over my body. Yes! I do really love that Back to the Future scene! And I was so glad to make it to your Powell's to hear you talk about the second book in this amazing series!! 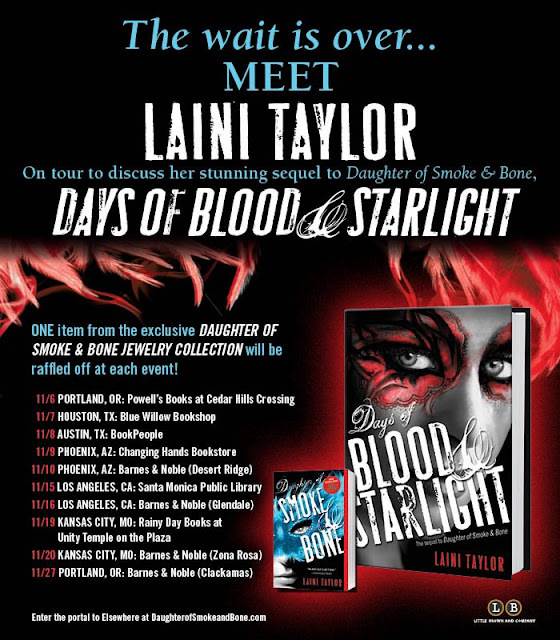 Can't wait to read Days of Blood and Starlight! Congrats on your newest book tour! Dear Dovile, I'm sorry for your frustration, but I wish you wouldn't take it out on me. You can't imagine that authors have any say in matters of publishing decisions or international book distribution. We don't. I really have no idea why the Kindle edition isn't available internationally, but I'm sure it's not for reasons of discrimination against non-Americans. In any case, I have no control, and am very sorry for the wait. It's 2nd July, and there's still no internationally available Kindle version. I know it's not your fault, but since I'm not in correspondence with the publisher, there's no one left for me to ask when, or even if it will be ever available electronically outside the US. I've bought the first book on Kindle, and have been waiting for the second one since last November (it would have arrived the day after my birthday, btw), but still nothing. At least if you could help me with an email address where I can ask the publisher myself.